A 52-year-old female with diabetes mellitus type I transferred to the SUNY Downstate Medical Center Emergency Department with severe lethargy and obtundation. She presented with arterial hypotension (60/30 mmHg), tachycardia (120 beats/min), and hypoxia (oxygen saturation 73%). Initial laboratory evaluation revealed blood glucose 800 mg/dL, with hemoglobin A1C of 14.3%. Her serum osmolality was 346 mOsmol/L. Urinary and blood ketones were negative. CBC, hepatic, and renal function tests were within normal limits. The clinical picture suggested that the patient had HHS. 24 h after admission, the patient had an episode of hematemesis. Esophagogastroduodenoscopy (EGD) revealed diffuse, circumferential, black-appearing, friable mucosa in the distal third of esophagus [Figure 1]. Biopsies were not taken due to high risk of bleeding and perforation from the severe esophagitis. The patient gradually recovered after conservative treatment with broad-spectrum antibiotics, intravenous proton pump inhibitor, total parenteral nutrition, and oral intake restriction. On day 5 of admission, biopsies of the esophagus were obtained with EGD. Histopathology revealed extensive necrosis, absence of viable epithelium, scant stroma, and necrotic debris, consistent with AEN. Her past medical history was only significant for poorly controlled type I diabetes mellitus. She denied tobacco, alcohol, illicit drugs, or nonsteroidal anti-inflammatory drug use. Blood and stool cultures, culture with polymerase chain reaction for cytomegalovirus, hepatitis panel, and HIV testing came out negative. On day 14 of admission, repeat EGD showed resolution of the black mucosa [Figure 2]. Subsequently, she had an uneventful recovery and was discharged from the hospital. Previously, several etiologies have been suggested including cardiovascular disease, renal insufficiency, cancer, alcohol intoxication, lye ingestion, candidiasis, herpes simplex virus infection, cytomegalovirus infection, antiphospholipid syndrome, diabetes mellitus, diabetic ketoacidosis (DKA), severe vomiting, acute gastric outlet obstruction, caustic injury from alkaline compounds, bismuth subsalicylate ingestion, medications, Stevens-Johnson syndrome, Henoch-Schonlein purpura, and hypothermia. ,,,,,,, Recently, a possible link between DKA and AEN has been demonstrated. ,, However, to our research, AEN secondary to HHS has never been reported. This represents the first case of AEN that initially presented with drowsy mentality in the setting of HHS. In such patients, transient nonobstructive gastropathy seen in overt hyperglycemia may have a role in pathogenesis of AEN,  adding on to the deleterious effects on the cardiovascular system by diabetes mellitus. In literature, numerous studies have demonstrated that the distal third of esophagus is less vascularized,  which makes it susceptible to ischemia caused by low splanchnic blood flow. Therefore, severe hyperglycemia-induced hypovolemia may considerably increase the risk of AEN, especially in patients with diabetes mellitus. Aggressive treatment of the underlying medical conditions with hemodynamic resuscitation, glycemic control, nil per os restriction, and acid suppression with high-dose intravenous proton pump inhibitors should be immediately instituted in patients with suspected or established AEN. Treatment of underlying HHS was crucial in our case, with complete recovery after supportive care. Major complications of AEN include esophageal stricture and perforation. The incidence of stricture formation was 25% in a recent case series. Esophageal perforation, generally seen in <7% of the cases,  is a life-threatening condition that should be suspected in cases with acute decompensation following clinical deterioration. 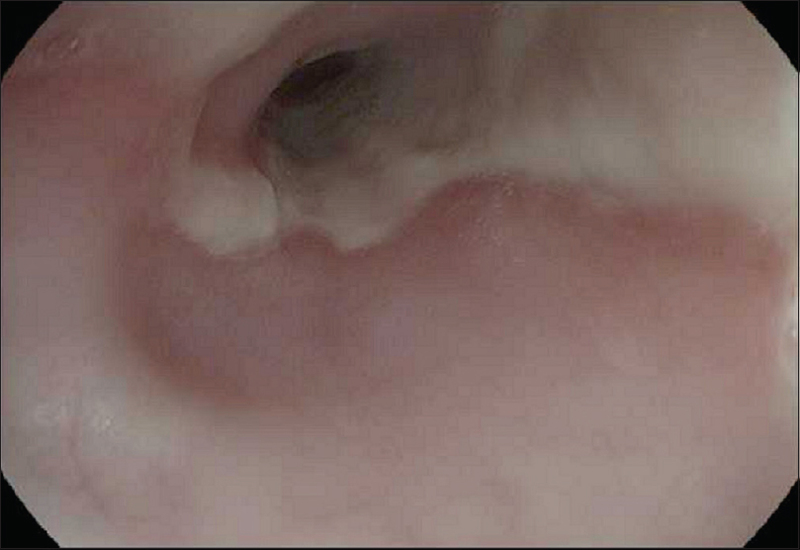 AEN patients who develop esophageal perforation require immediate surgical intervention. Overall mortality in patients with AEN is 32%. However, AEN specific mortality is 6%. AEN should be considered as a potential diagnosis of elderly diabetic patients presenting with acute upper gastrointestinal hemorrhage. The development of this disease remains a ''red flag'' for increased overall mortality due to underlying medical conditions. Thereby, AEN prompts a timely diagnosis warranting physicians to have knowledge and awareness on this serious clinical syndrome. Gurvits GE, Cherian K, Shami MN, Korabathina R, El-Nader EM, Rayapudi K, et al. Black esophagus: New insights and multicenter international experience in 2014. Dig Dis Sci 2015;60:444-53. Lacy BE, Toor A, Bensen SP, Rothstein RI, Maheshwari Y. Acute esophageal necrosis: Report of two cases and a review of the literature. Gastrointest Endosc 1999;49:527-32. Day A, Sayegh M. Acute oesophageal necrosis: A case report and review of the literature. Int J Surg 2010;8:6-14. Augusto F, Fernandes V, Cremers MI, Oliveira AP, Lobato C, Alves AL, et al. Acute necrotizing esophagitis: A large retrospective case series. Endoscopy 2004;36:411-5. Worrell SG, Oh DS, Greene CL, DeMeester SR, Hagen JA. Acute esophageal necrosis: A case series and long-term follow-up. Ann Thorac Surg 2014;98:341-2. Iorio N, Bernstein GR, Malik Z, Schey R. Acute esophageal necrosis presenting with Henoch-Schönlein purpura. ACG Case Rep J 2015;3:17-9. Abed J, Mankal P, Judeh H, Kim S. Acute Esophageal Necrosis: A case of black esophagus associated with bismuth subsalicylate ingestion. ACG Case Rep J 2014;1:131-3. Carneiro M, Lescano M, Romanello L, Módena J, Carneiro F, Ramalho L, et al. Acute esophageal necrosis. Dig Endosc 2005;17:89-92. Gurvits GE. Black esophagus: Acute esophageal necrosis syndrome. World J Gastroenterol 2010;16:3219-25. Talebi-Bakhshayesh M, Samiee-Rad F, Zohrenia H, Zargar A. Acute Esophageal necrosis: A case of black esophagus with DKA. Arch Iran Med 2015;18:384-5. Fraser RJ, Horowitz M, Maddox AF, Harding PE, Chatterton BE, Dent J. Hyperglycaemia slows gastric emptying in type 1 (insulin-dependent) diabetes mellitus. Diabetologia 1990;33:675-80. Halter JB, Musi N, McFarland Horne F, Crandall JP, Goldberg A, Harkless L, et al. Diabetes and cardiovascular disease in older adults: Current status and future directions. Diabetes 2014;63:2578-89. Burtally A, Gregoire P. Acute esophageal necrosis and low-flow state. Can J Gastroenterol 2007;21:245-7. National Centre for Health Statistics. Health, United States. (Accessed January 23, 2016, at: http://www.cdc.gov/nchs/products/pubs/pubd/hus/older.htm#healthstatus). Desenclos JC, Bourdiol-Razès M, Rolin B, Garandeau P, Ducos J, Bréchot C, et al. Hepatitis C in a ward for cystic fibrosis and diabetic patients: Possible transmission by spring-loaded finger-stick devices for self-monitoring of capillary blood glucose. Infect Control Hosp Epidemiol 2001;22:701-7. Perz JF, Fiore AE. Preventing the transmission of bloodborne viruses during glucose monitoring: Lessons learned from recent outbreaks. J Am Med Dir Assoc 2006;7:65-6. 2 Candidiasis in a Patient With Black Esophagus: Cause or Incidental Finding?